Turn over the middle pile to reveal the true suit. In this instance the face card will be the Queen of Clubs (figure 6, again). Turn over the third pile to reveal the true value, an Ace. In this case the card showing will be the Ace of Hearts (figure 6, again). Finally, name the selected card according to the results of the lie detector, saying, "Please turn over the Ace of Clubs you deceitful person (or words to that effect!)." The rest of the deck is still in Si Stebbins order, therefore, you can now repeat the effect for another spectator. This section of the deck cannot be cut because thirteen cards are missing from the sequence. You, therefore, simply spread the cards and have him select a card from the upper half of the section. There must be at least thirteen cards left below the selection. 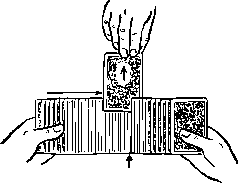 After the card has been withdrawn, split the spread taking all the cards above the selection point with your right hand (figure 7). Place these cards below the lower section and square the deck. Push off thirteen cards and repeat the trick. The effect here is the same as the previous one except that there are two selected cards. The spectator selects either one to be the subject and puts the other into his pocket. At the end, the three piles reveal the true color, suit and value of the chosen card. As an afterthought, you remember that the spectator put a second card into his pocket. You turn the three piles over then you turn over the top card of each. The color, suit and value of the three new cards together identify a possible second card. When the spectator brings the other card from his pocket, it proves to that very card. Set the deck in the Si Stebbins arrangement. The spectator would, again, cut the deck but this time he would remove the top two cards as the selections. As in the previous effect, we will assume the top two cards of the deck to be the first two cards of the original Si Stebbins arrangement. 1. Have the spectator deal the top card face down onto the table. Mentally remember this first card as top. Have him deal the next card onto the table to the right of the first. Remember this card as bottom. The spectator will be doing the dealing so the two cards might finish in the opposite order. It is important that you practice the memory bit because you will need to remember either top or bottom until the end. I use a simple mnemonic device for top and that is, "Mario's wig!" For bottom, I simply imagine Mario's wig falling off! I am serious when I say that these are the images I use. Try them. You cannot fail to remember the correct word. In this example, the card on your left is the Ace of Clubs and the other card is the Four of Hearts. 2. At this point, the spectator puts either one of the cards into his pocket. Let us assume that the Four of Hearts goes into the pocket. This leaves the Ace of Clubs as the subject of the experiment. Remember top. 3. Push off the top thirteen cards of the deck without reversing their order, and place the balance to one side. 4. Carry out Step 4 exactly as outlined in the previous effect with one small change. After having deposited the first two piles onto the table, you will be holding five cards. In the previous effect, we simply dropped these cards onto the table as the last pile. In this case, however, we need to transfer the card that is second from the bottom to the top while leaving the bottom card in place. Here's all I do to achieve this. After asking the last question regarding the value of the card, I simply count the cards from hand to hand, reversing their order, but leaving the last card where it is. 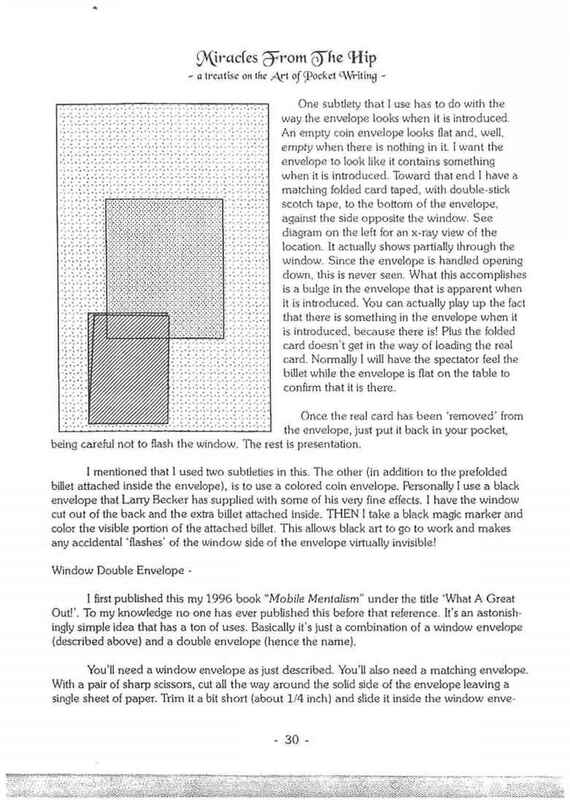 I then replace the four cards on top of the single card and drop the packet onto the table at position three. correct answers. If you are remembering the card as bottom, you will turn each pile face up to reveal the correct answers. In the present example, we are remembering top, therefore, we turn over the top card of each pile moving from left to right. These disclose the true color, suit, and value of the card on the table. The cards you will turn in this example will be, from left to right: the Seven of Spades, the Queen of Clubs and the Ace of Hearts (figure 1).